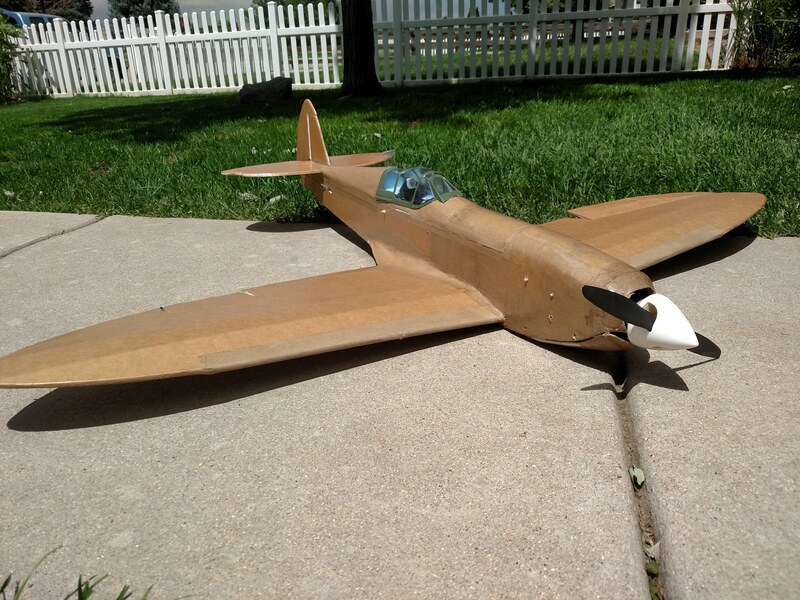 Rebuilding a Spitfire... found the original to be one of the best-flying, most simple, elegant and fun RC planes EVER. Stuck a huge e-Flite motor in it and 4s 1300 mah for crazy vertical and life-affirming powaaa. But have been struggling to deal with the open-nose area. Also not happy with the lack of a cockpit, no top hatch, and slab-sides. It's been almost 6 years, FT - when are we going to get some product-improvement? 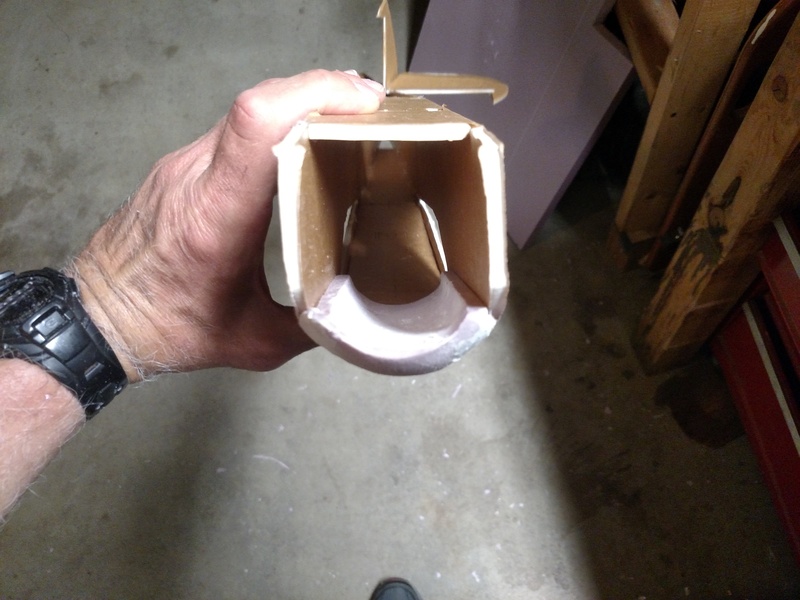 Making a nosecone and the under-tray out of pink foam with fiberglass skin. Will have under-propeller cooling duct. Loads of compound curves - not too easy. Will also do new formers on bottom and sides to get rounder fuse. Going with Durafly Mk I Spitfire cockpit for scaly effects. Will be making my own exhaust stacks for same. 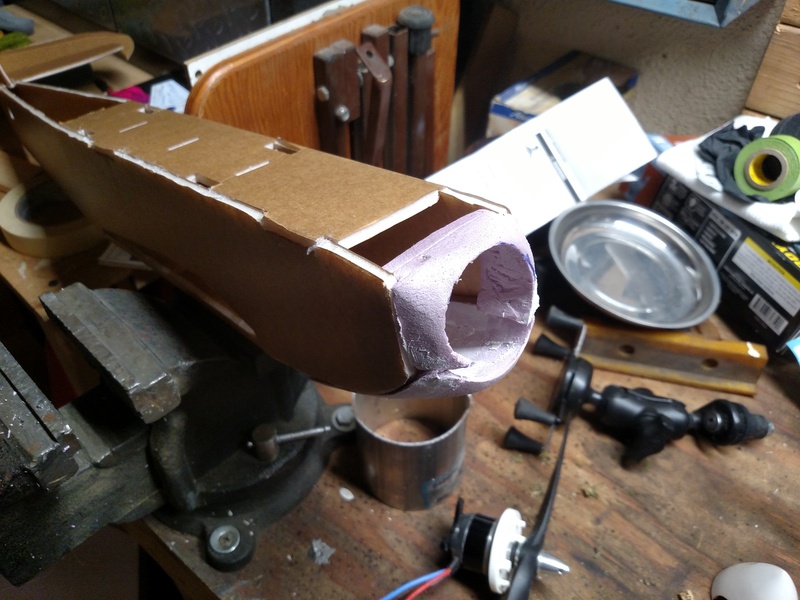 Nose cone pieces refitted, sanded, fiberglass placed, WBPU coated to try to relieve heavy cloth weave , now attempting to build hatch top and newer motor mount. 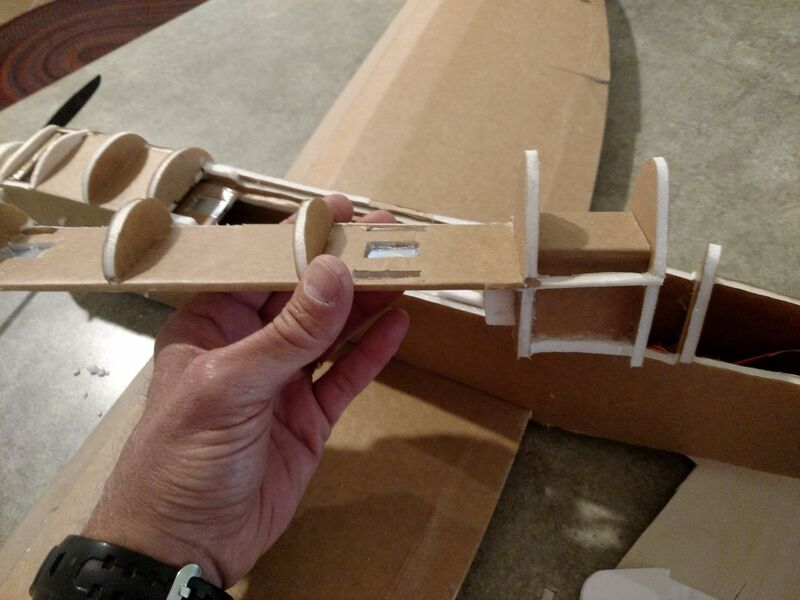 Contemplating using brown paper to cover the model with either WBPU or 50% wood glue/water mix. You will notice that it's not super scale. But, it's better than a totally open nose. Using Titebond-water and brown Kraft paper can be somewhat challenging. 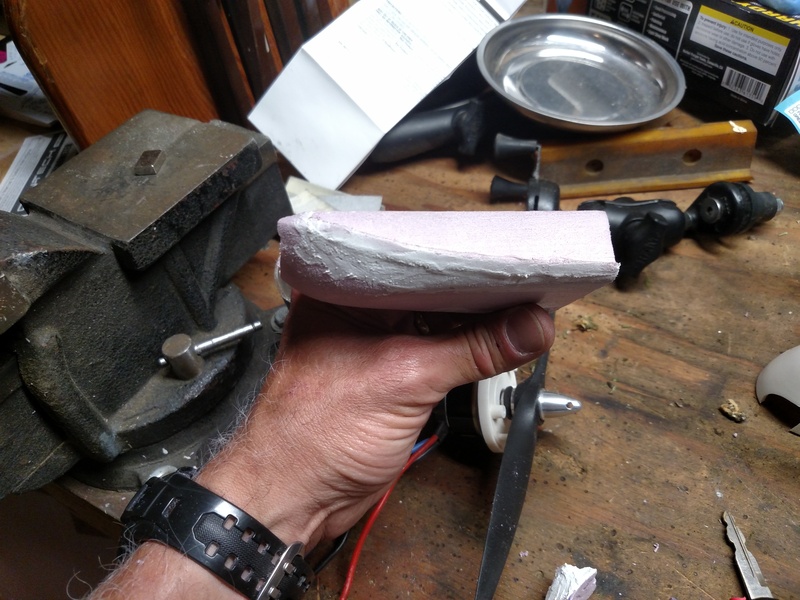 I have never done this before and had some things to learn about how it works - it is thin but forms a hard shell over soft EPS (pink insulation you can buy at Home Depot) foam. You need to wet both sides and the surface. The paper immediately stretches, so you need to drape it while it is wet. 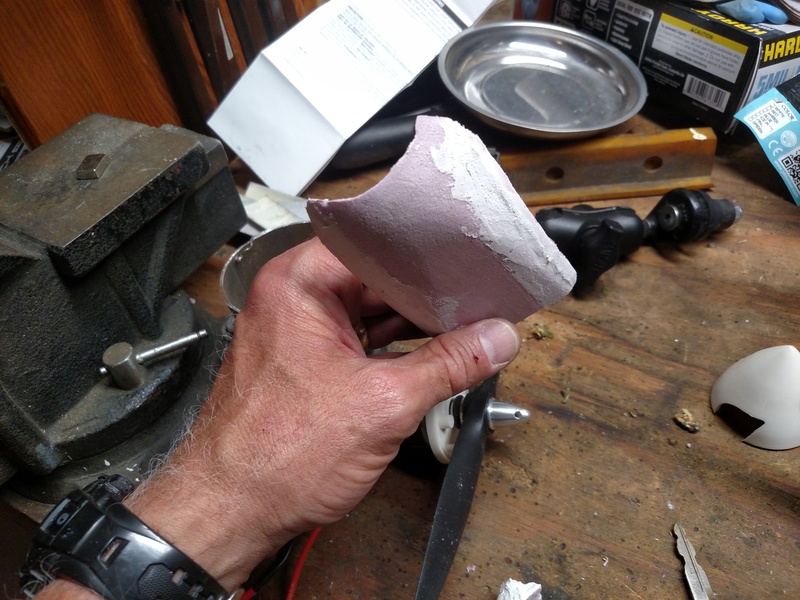 You smooth it with a wet finger over compound curves as it will stretch somewhat. When it cures the lines over previously-laid pieces or small wrinkles will be invisible or nearly so. I tried on a different front end arrangement - many formers? 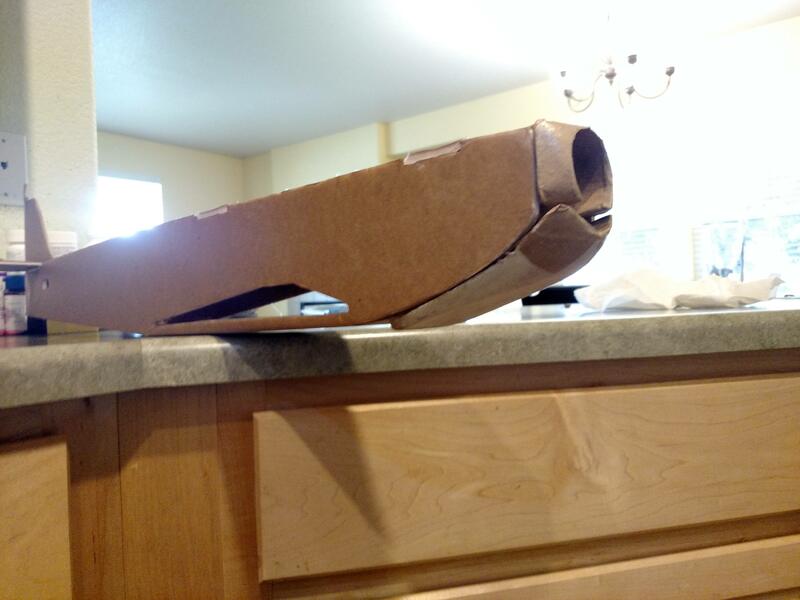 Brown kraft paper instead of paperboard? I tried this approach and discovered that the paper dries and cures in a somewhat unpredictable fashion, shrinking less in one direction than another. 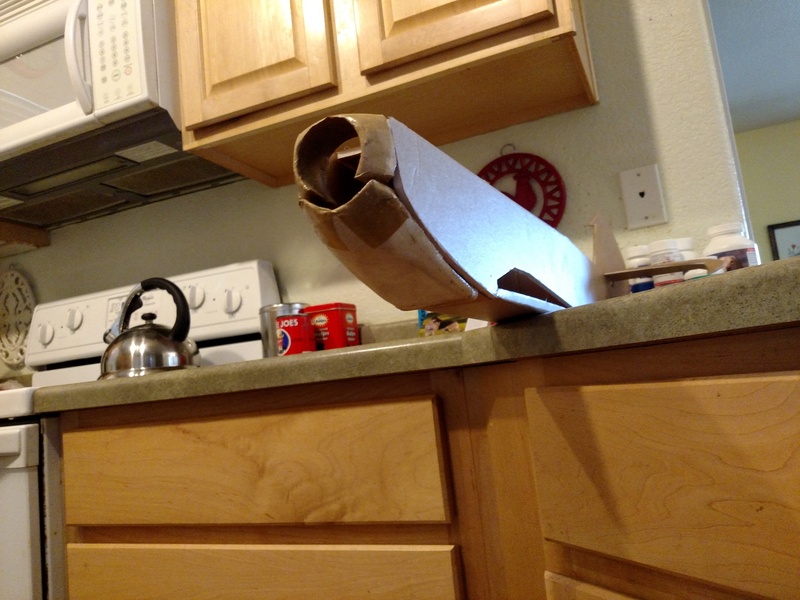 If there is significant distance between formers and you orient the wet kraft paper in the wrong way, the shrink during drying will cause undesirable wrinkles. I ripped all of this stuff off and shaped in the upper nose area in pink foam on a belt sander, finishing with hand sanding, lightweight spackle and a nice coat of the kraft paper and glue. Notes on using the brown kraft or masking paper: This stuff shrinks but not as much as tissue, and not in a uniform fashion. If you lay it across formers or ribs, you might not get the results you are looking for. I have found it to be a far better covering over solid surfaces. Once it dries, it will present a rough surface. You will be concerned; don't worry! 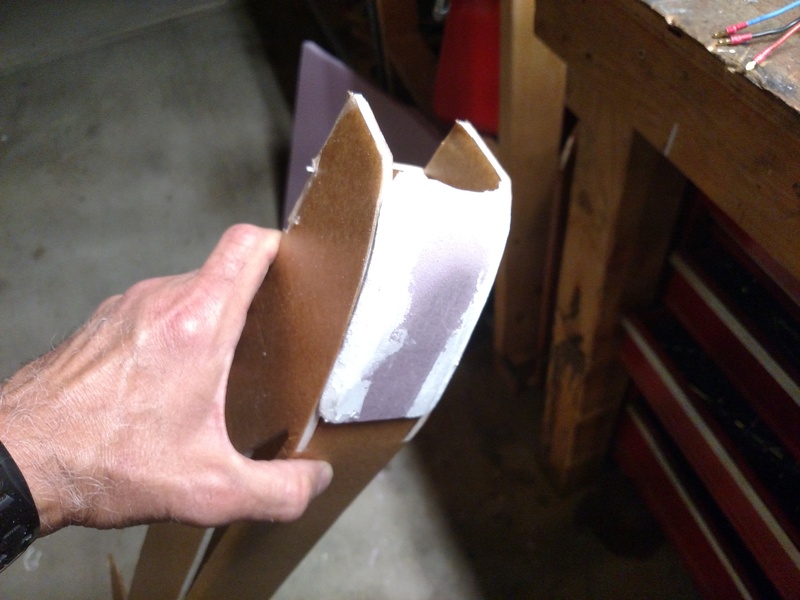 You take a small foam block or detail sander and place a piece of 400 grit on it, and in (literally) 9 strokes, it will turn up as glass smooth, ready for another surface treatment. 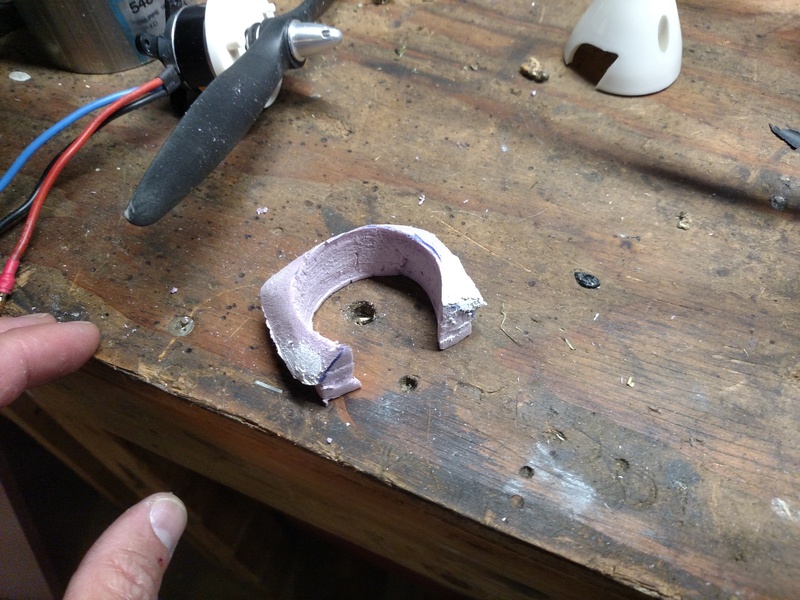 I have been using water-based polyurethane, applied in multiple layers (a quick buff between layers gets great results and a harder surface still. That looks great, look forward to seeing the finished product. 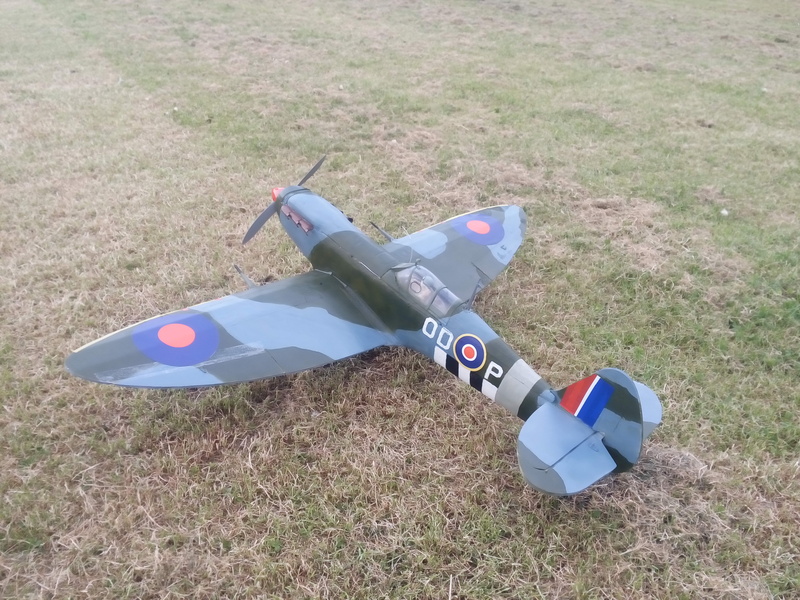 i'm new to the hobby so not flown too many planes, but this a great plane and looks great in the sky, also makes a great base to work on. I decided that I'd dump the plywood firewall, with its amateurish "using tape for support" thing. I found some thin steel at Home Depot and broke out the shears and the 90 amp welder, and created a couple of copies of a metal motor mount. It has an "L" shape with side supports. 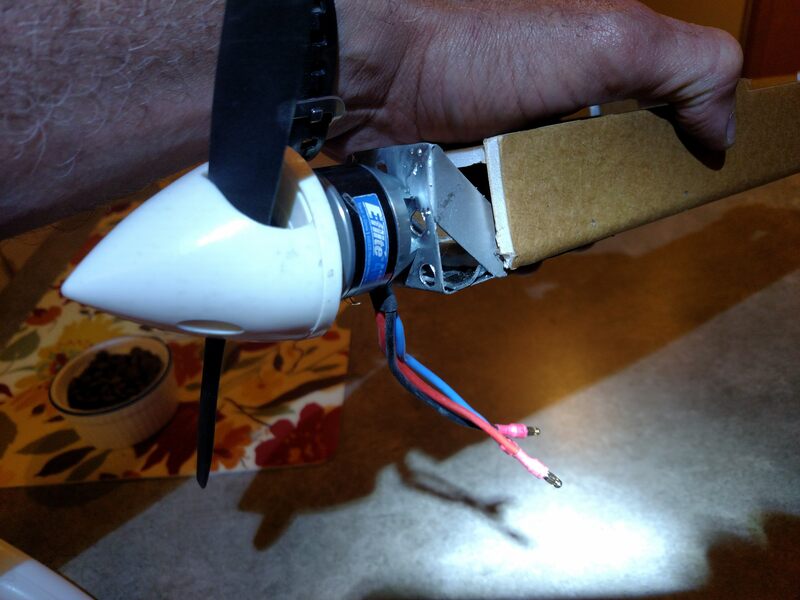 I put the radio set in the bird and set up the servos, placing the Hitec 60 amp speed controller hanging down from the bottom of the power pod in the slipstream of the air. It should be noted that there is a split in the bottom of the lower nose fairing that allows whatever air that can get by the spinner to make its way through the body of the aircraft and out the rear vent. 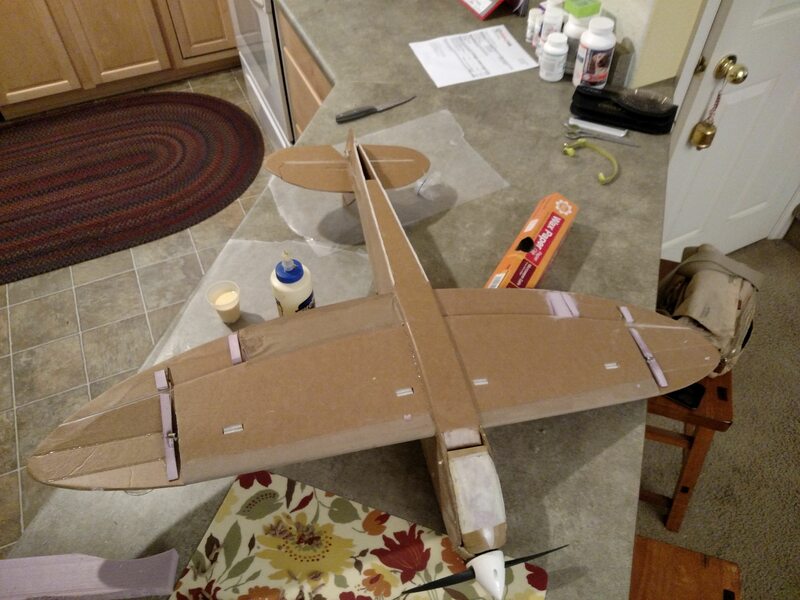 I have also left the area open where the front of the wing assembly attaches to permit warm air for the motor to escape. Ship was tail heavy and jumpy, but overpowered (as usual). I am out of practice. This is a very forgiving airframe. I added 50 grams of noseweight under one of the panels I added to the nose. This turns out to have been... a questionable decision? I flew the aircraft at least three more times to get a good feel for how it would trim with the new noseweight. Flight performance was great, very much like the old testbed. And the motor mount's welds failed, bowing the light thin steel outward. I took a day to construct a new mount out of steel that I had laying around, re-welding, cutting holes for lightening, etc. After a day of work in the garage I produced a heavy, moderately unattractive but decidedly solid mount... Original mount's weight was 24 grams. The new one? 76 grams. So there's my 50 extra, and now I'm carrying ANOTHER 50 due the the screws I hotglued under the nose panel. 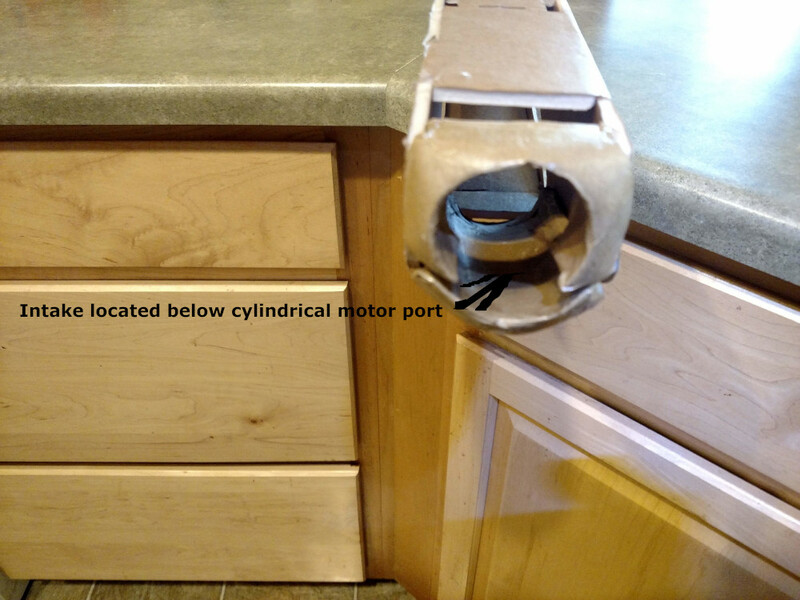 During this installation of the new mount, I was careful to shim the motor mount to give me both noticeable right and down thrust, about the mandatory 3-4 degrees of each. I had already cut the hatch, deciding to make it quite long so as to be able to access the electronics and battery. I have tried to create a viable hatch in the past and failed, and did so in this one, too.I I put three magnet sets into the thing and could not get them to lock the hatch in. 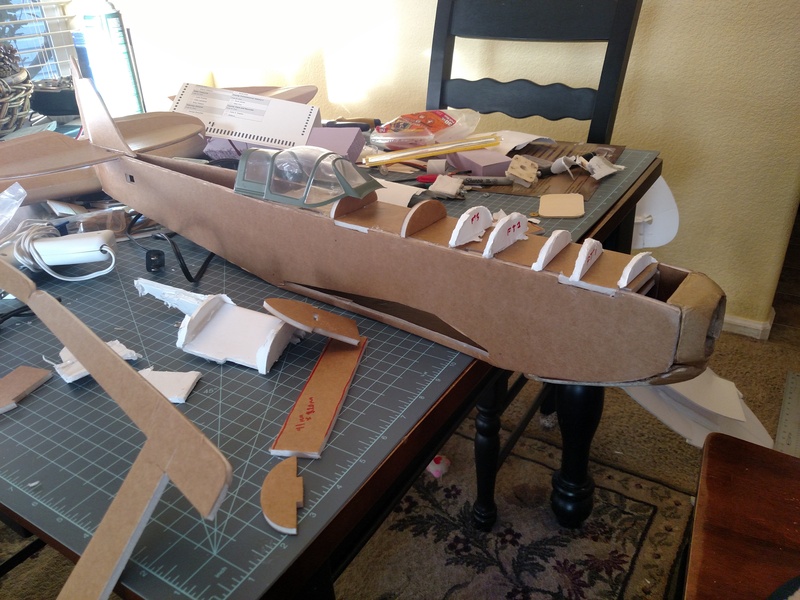 I finally recognize that I had to put a strong box shape at the aft end of the hatch, and I also glued a thin piece of basswood to the bottom in order to give it enough structural rigidity to retain its shape. I glued magnets to the top (carving a hole to the other side of the paper for them. The hatch would not sit straight without buttloads of tuning, tweaking and fiddling. Plus, it was showing a big slot, which I felt was ugly. I did figure out how to counteract all of this hoo-raw, and could have shaved probably another 25 grams off the weight of the ship had I understood how to do this elegantly and simply. 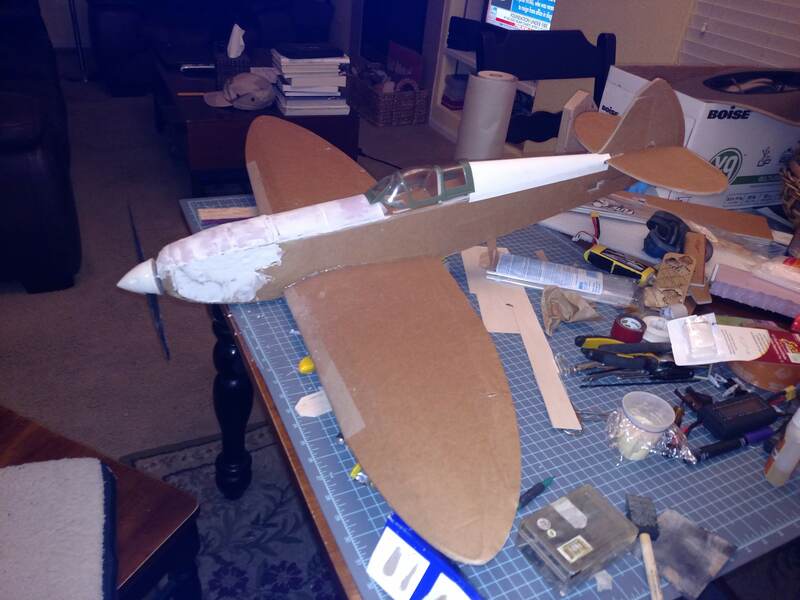 You can see that I cut down the upper forward support for the rear turtledeck and slid it backward to accommodate the Durafly Spitfire canopy I had from the previous incarnation of this model. I have never liked the way the canopy was configured in this ship and always wanted to make it more scale in appearance. When I had applied the brown craft paper to the nose, I used my heat gun. Heat guns are hot. Hot things melt low-temperature foam board. I had to mud in the nose repeatedly and sand to smooth to fix that screwup. 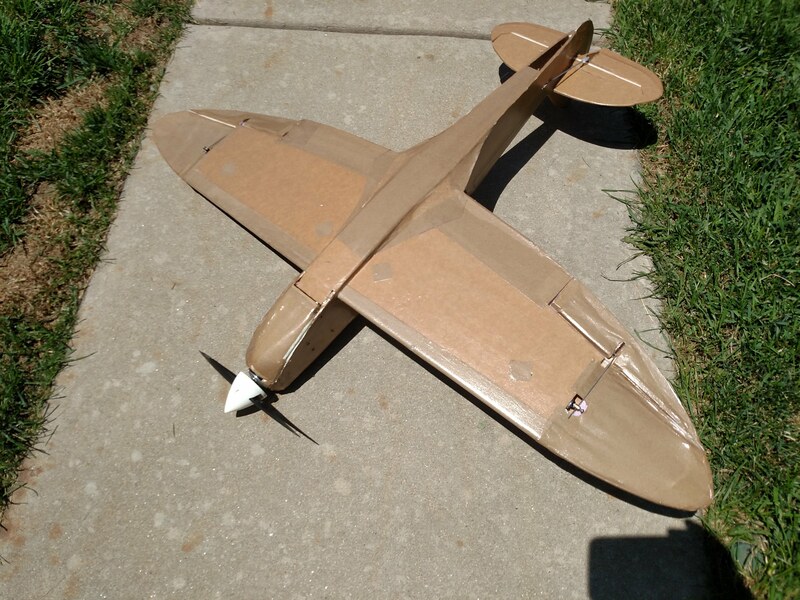 I have felt that I have enough piloting skill to fly the aircraft without undercambered airfoils, so I elected to use the brown paper covering method to cover the underwing area (where flaps would be) and to cover the tips creating a flat-bottomed airfoil there. Results were... imperfect. 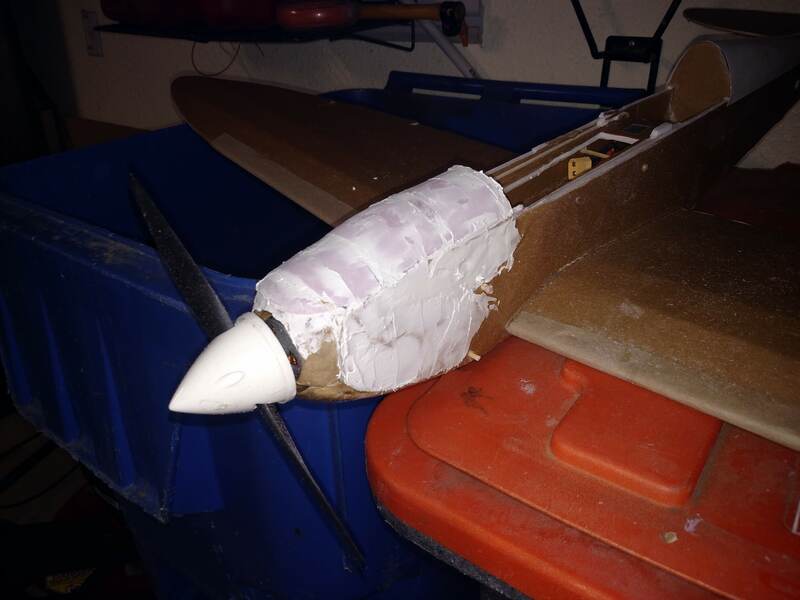 You can see that I've gotten the port wing done and there are sags, and the aileron wasn't very smooth. 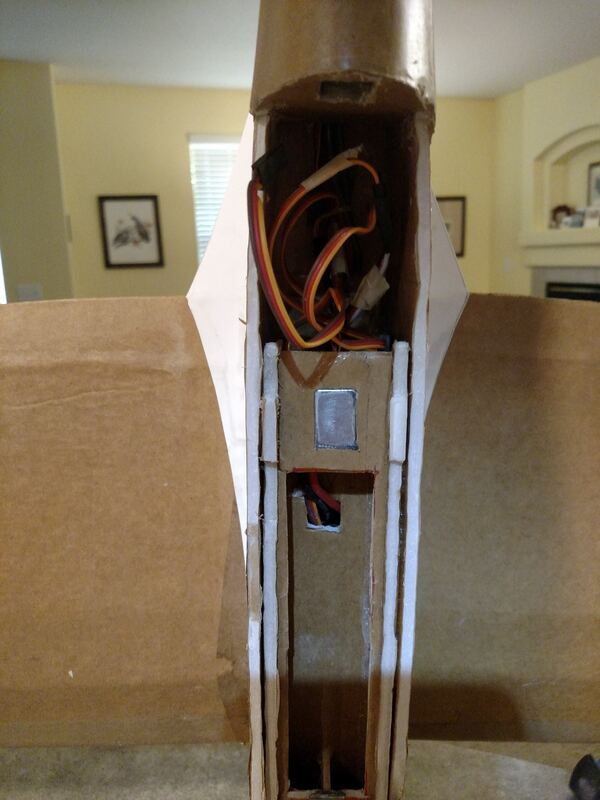 I also wish that I'd made this decision earlier and had gotten serious about putting an access door on the servos. 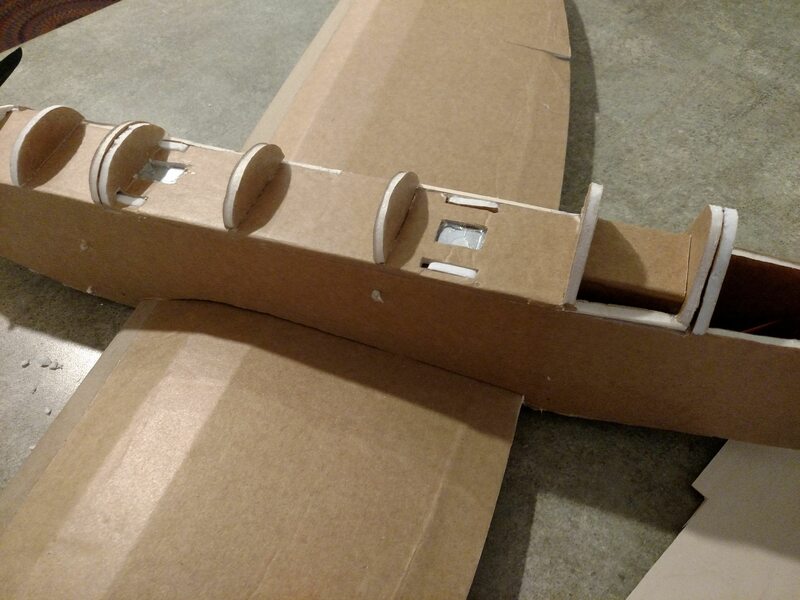 If I redo the plane again, I will change the wing construction to rid me of the unscaly creases on the upper surface and the inability to access and replace the servos. I could hide them more appropriately. 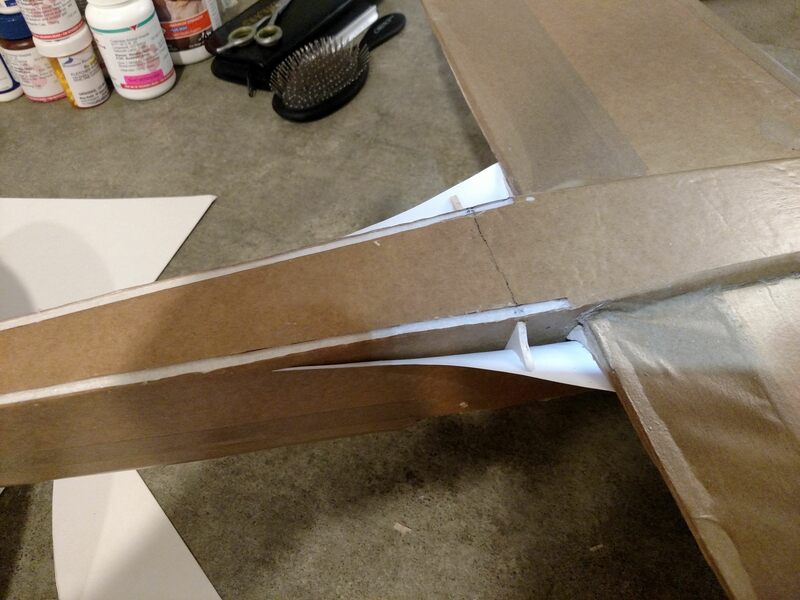 I decided that I'd like to put wing fairings onto the airframe, to increase the scale lines. As I considered how I would do this, I looked at a "200% FT Spitfire" video on youtube. 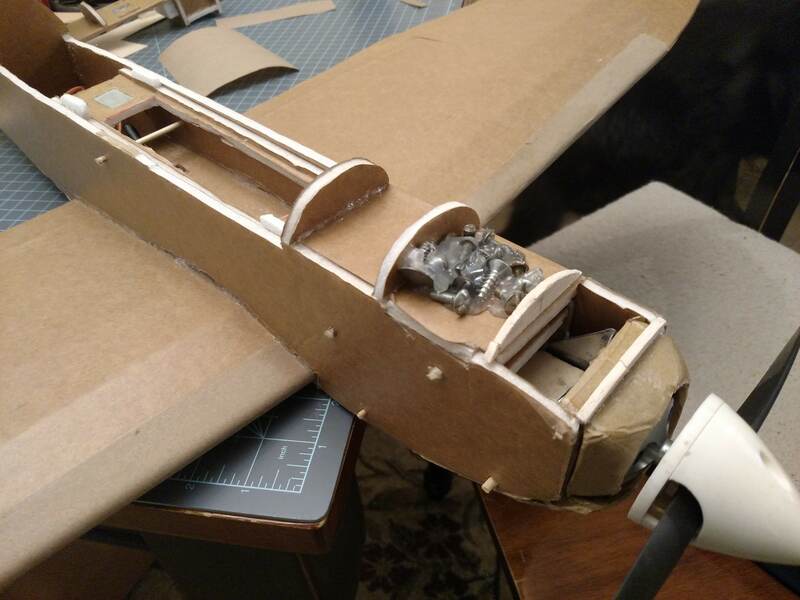 The poster showed ribs getting fitted to the cradle between the wings and the fuselage. 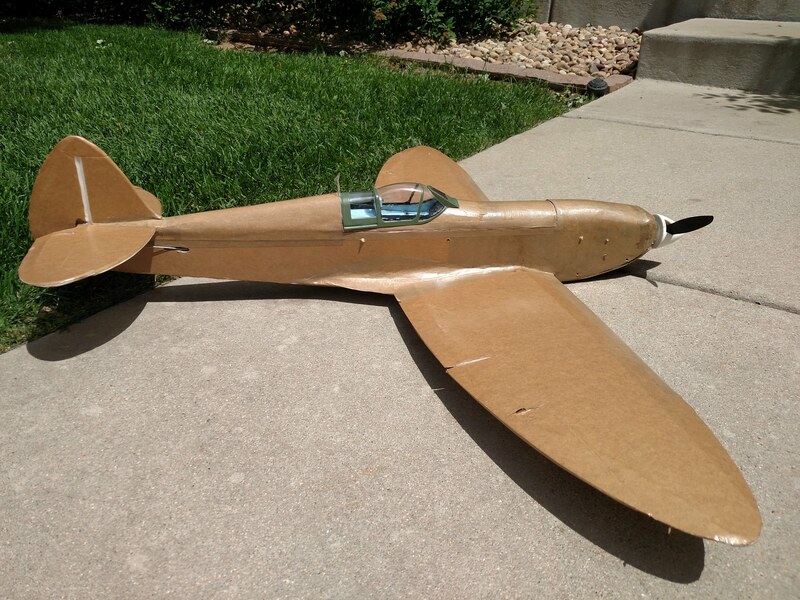 I also looked at Nic Lechner's wing fairings on the P-39 and thought, "Hmm, maybe I can model this in paper and fit it to the airframe." I fiddled with it for a couple of days and got some pretty good results. 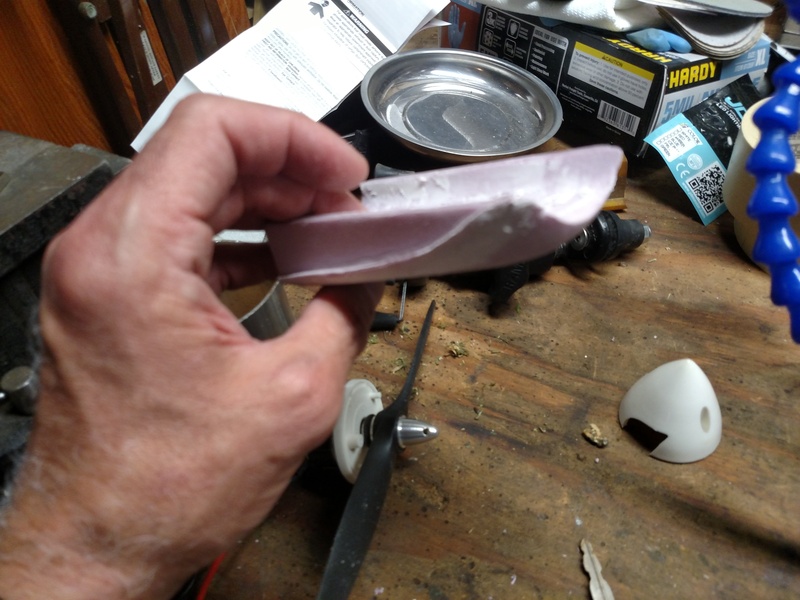 I supported the insides of the fairings with some pink foam and a little balsa. Paper covering with copier paper seemed to go fairly well, then I elected to coat with the ubiquitous brown paper and glue. The results were better than I thought they'd be! They have also complicated the effort to get the airframe aloft as it is harder to hold the ship up and launch it. I may have to throw underhanded to do it. The under-wing, finished and curing in the sun. I don't have a pilot. I placed a piece of shaped foam to angle an instrument panel. I found a rendered panel on the internet and shrunk it to the appropriate 1/10.5 scale size, then printed it up in color. I glued the printout to some posterboard and placed it in the front of the cockpit. These Spitfires used a robin's egg blue interior color on the inside of the cockpit. I created kind of a pilot's headrest and put it in the cockpit. 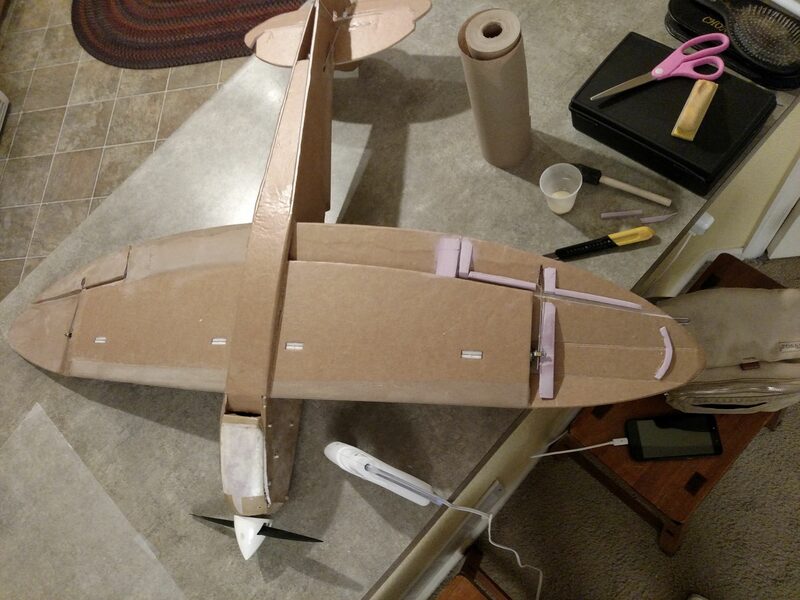 I glued the canopy on last night. The hatch's ugly line left me thinking - how can I hide this? I had an inspiration - use the paper and glue and stick a super-straight piece on all the lines. When dry, slice with a new blade. Boom! Ugly hatch gap GONE! Sorry for the multiple pics. I am perhaps unclear on how best to post photos in this forum.